New! No Broker Fee. Photos don’t do justice to this designer, well-laid out, studio loft condo with miles of open views from two oversized windows from one of NYC's most iconic buildings. 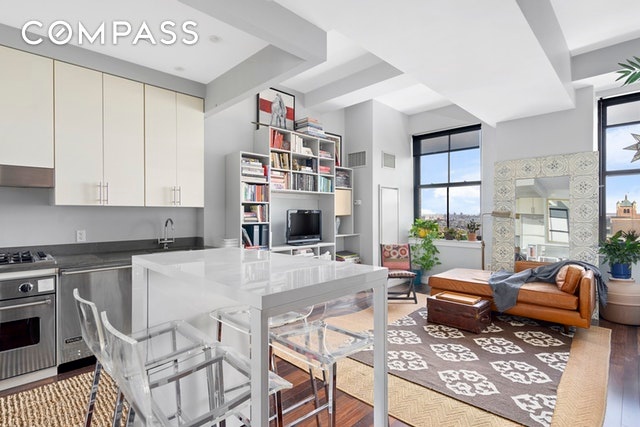 Enter 17E at One Hanson Place through a wide corridor with a large closet and plenty of space for furniture, then proceed into a roomy, light-filled living area with a custom Murphy bed tucked away against one wall. 10.5 foot beamed ceilings above, chestnut strip flooring below, and custom finishes throughout. Enjoy cooking? The kitchen is larger than you’ll find in most one-bedroom apartments and includes loads of cabinet and counter space, Viking, Sun-Zero and Bosch appliances. Two 6-foot east-facing, windows frame miles of open sky high above the Ft. Greene and Clinton Hill landmark districts, with their hundreds of stately brownstones and mansions. Custom marble and granite bath with soaking tub and linen closet. Converted to loft condos in 2007, One Hanson offers the best features of two worlds: a truly iconic, expertly-run condo building with character, soul, and history, yet with new interiors. No cookie-cutter apartments here. Private storage locker included. Building amenities include 24-hour doormen, gym, three landscaped and furnished decks with panoramic City and Brooklyn views, two bike storage rooms, conference and game rooms. One Hanson Place is the landmark former Williamsburgh Savings Bank Building whose rare, four-sided clock tower has kept time for Brooklynites for nine decades. The location cannot be more ideal: nine subways and the LIRR's Atlantic Barclays Terminal are outside the front door. BAM is next door and Barclays Center is two blocks away. Brooklyn's newest Apple Store and Whole Foods are across the street. Historic Ft. Greene Park is three blocks away and the building is surrounded by dozens of restaurants, cafes, bars and cultural venues of every type and on any budget. Brokers, CYOF.